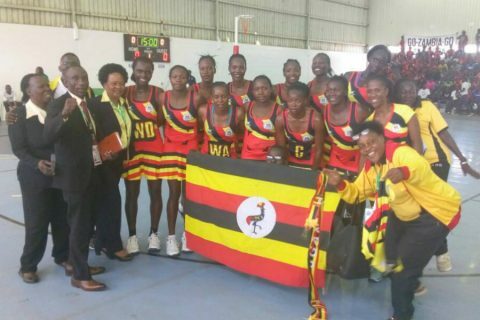 LIVERPOOL – Uganda’s senior Netball team the She Cranes lost their opening game at the 2019 International Vitality Netball Series in UK. Despite trying to stage a late come-back, the She Cranes could not help but fall 46-50 to the England Roses in a thrilling encounter played at the Echo Arena in Liverpool, United Kingdom. This being the first of the three game series, the teams will now face off again in the remaining two games of the at London’s Copper Box on Friday, 30th November and Sunday, 2nd December. These series were lined up to prepare both sides for the forthcoming 2019 Netball World Cup that is set to take place in Liverpool-England. Facing off on Wednesday, this was the first meeting between the sides since the Commonwealth games group stage game which Cranes lost 55-49 earlier this year. The game was also the first for England to play on home soil since they won the Commonwealth gold medal. And Uganda were pumped up to spoil the hosts’ party. Uganda had a slow start as the team fell 15-8 at the end of the first quarter, and the worst was yet to come. The Roses capitalized on Uganda’s inability to get going as the hosts ensured they went into halftime leading by as many as nine goals (30-21). Uganda came back the strongest in the second half, reducing the deficit by two going into the last quarter. Led by Peace Proscovia who was playing against familiar faces due to her previous long spell with England’s Loughborough Lightening, the team ran riot to level the match 43-43 towards the closing stages of the game. However, the She Cranes couldn’t hold onto their dear lives as England managed to resurrect and survive a home shock, to seal a four goal victory. GK-Usuro Brown, GD-Guscoth, WD-Clarke, C-Guthrie, WA-Natalie Haythorntwaite, GA-Housby, GS-Dunn. GK-Stella Nanfuka, GD-Lilian Ajio, WD-Muhayimuna Namuwaya, C-Nakachwa Halima, WA-Ruth Meme, GA-Rachael Nanyonga, GS-Peace Proscovia. -England vs Uganda, 02-12-2018 @London’s Copper Box.